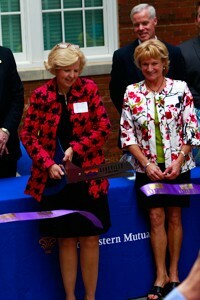 Welcome to the website of Carole Martin,CLU®, Managing Director of Northwestern Mutual's Asheville district office. Carole's work with clients in the Asheville area over the past 32 years means that she has the insight and experience necessary to help lead you and your family to a secure financial future. As a Northwestern Mutual Financial Advisor, in all situations I will make those recommendations which I would do for myself and my family if faced with a similar situation. By utilizing state of the art insurance and investment tools, I will help you protect and provide for those you care most about. I will work hard to build a relationship of trust and integrity, so that insurance and investments are two less things for you to worry about. Northwestern Mutual's Asheville office is proud to participate in Northwestern Mutual's philanthropic program to accelerate finding a cure for childhood cancers and offer support for families facing the struggles of this disease. The Northwestern Mutual Foundation is partner with Alex's Lemonade Stand Foundation and Starlight Children's Foundation, two national organizations with expertise and programs to help us reach these goals. In April 2013, our office hosted a Northwestern Mutual Lemonade Stand in our community to raise money for Alex's, which funds pediatric cancer research and helps families with travel expenses to get their child to out-of-area treatment centers. This multi-year commitment harnesses the passion of thousands of Northwestern Mutual's field force members, including their families, friends and clients to provide help for today and hope for tomorrow to children and families battling this disease. A special thank-you to everyone who came by the stand to support a great cause and enjoy some delicious lemonade!